Academic CV available by request. (1) How the shisha ban emerged in the City of Toronto? (2) What implications the shisha ban has on Muslim placemaking practices? (3) And how activist and arts-based work can and is addressing surveillance and illegalization of Muslim people in the city. 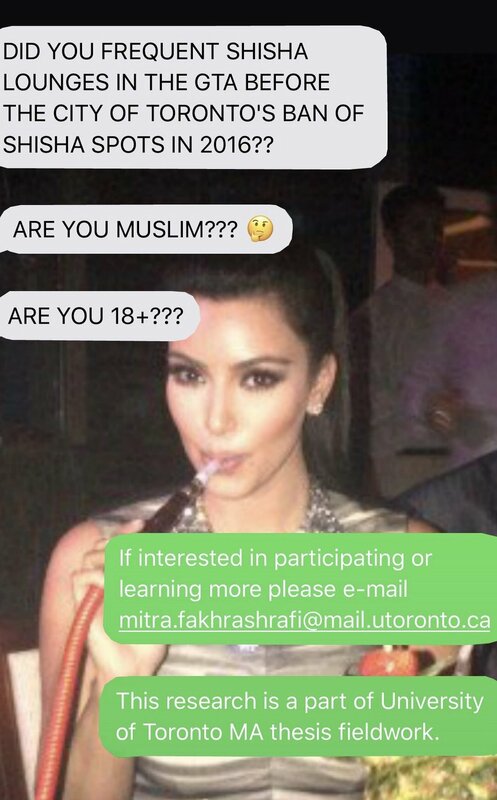 Please contact if interested in participating to archive Toronto’s shisha lounge history, trace the rise of its illegalization, and imagine the futures of Muslim placemaking in the GTA. slides from "Sanctuary Inter/rupted: Assessing Toronto’s Shisha Ban” at the American Association of Geographers Annual Meeting, New Orleans, LA, 10-14 April.